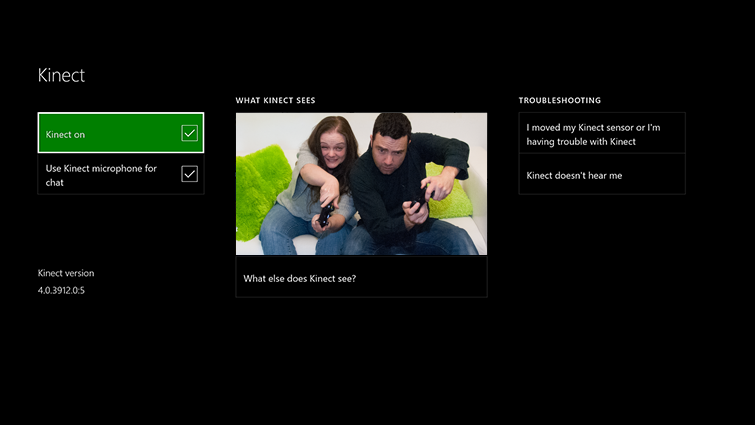 This page describes how to turn your Kinect sensor on or off. It also explains which features are disabled when your Kinect sensor is off. Select Kinect on or Kinect off. 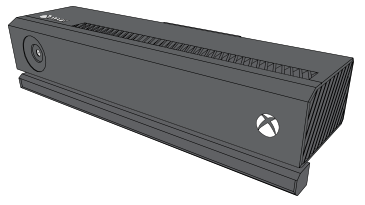 The Xbox logo on the front of your Kinect is bright when the sensor is turned on. If the Xbox logo is not bright, your Kinect sensor is turned off. Note There is a small LED (light) next to the camera light. This is the privacy LED. The privacy LED is bright when the camera is active. If your Kinect sensor is on and the camera is being used, the privacy LED will not be bright. The Kinect camera - You will not be able to use gestures or play games using Kinect. The Kinect microphone - Voice commands and voice chat will not work. The Kinect infrared (IR) camera/blaster - IR commands will not be sent or received. Therefore, some features will not work. For example, you will not be able to change the TV channel through your Kinect sensor. If you're having trouble with your Kinect sensor, unplug the sensor for 10 seconds, and then plug it in again. Would you like to contact Support regarding the "How to turn your Kinect sensor for Xbox One on or off" issue you were reading about or a different issue?